A train that was stuck in the snow for nearly 40 hours with 183 passengers on board has resumed its journey - by going backwards. The Amtrak service from Seattle to Los Angeles was stopped by a tree on the track in Oregon on Sunday evening. Heavy snow and downed trees prevented crews from reaching the train until Tuesday morning. A locomotive then pulled it back to Eugene, Oregon. No one was hurt but passengers said there was a lack of food and water. Other items such as nappies and female sanitary products were also running out and people said stress levels were rising. One passenger, Rebekah Dodson, told KTVL News: "We've gotten yelled at for opening windows. We can't get off the train because there's 4ft (1.2m) of snow in every direction. There's nowhere to go." In a separate interview with CNN she said several students "panicked" because their university professors were refusing to accept their excuse for missing classes. She added that the group includes about 20 students from Japan, and that there is poor mobile phone reception in the region. Several American Red Cross volunteers were waiting to offer snacks and water to the passengers once the train reached Eugene. The Coast Starlight Train 11 was stuck near Oakridge, a small town that lost power and saw roads blocked after it was covered in heavy snow. Amtrak said no passengers would be charged for any food or water. They were working with the Union Pacific rail company to clear tracks. 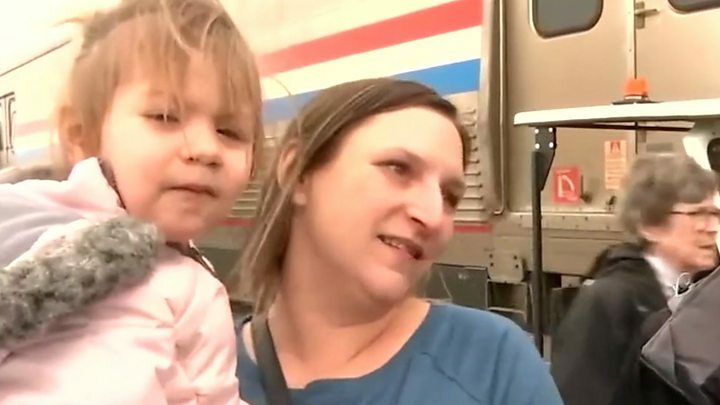 Passenger Carly Bigby told the BBC a locomotive had arrived around 06:00 local time on Tuesday, though Amtrak informed them it was "going to be a slow go". In a statement, Amtrak said the train was ultimately on its way back to its point of departure, Seattle, but "due to weather conditions, additional delays are to be expected along the route". In a further statement from its chief executive, Amtrak expressed "sincere regret" and promised refunds. Amtrak said that passengers were kept on board the train because of the power outages in Oakridge and to avoid separating passengers between the town's two small hotels. Residents in Oakridge said the situation there was also growing dire, as local petrol stations and grocery stores shut due to lack of electricity. "You can't get a hold of water, you can't get a hold of food, you can't get a hold of any sort of fuel to create heat or to cook with," Christina Mentzer told KPIC-TV. "So people are looking for propane, people are looking for gasoline, people are looking for water. "Today they're asking, but as of right now essentially what's going on is they're going around town finding where they can get stuff if it gets that bad." Reality Check: When is a train on time? UK snow: Why is my train cancelled in cold weather?